This is the first in a series of three blog posts about longleaf pine in the South. We’ll try to answer why longleaf? We’ll talk to landowners who are restoring longleaf on their property, and we’ll learn about the resources available to landowners who wish to make the switch. 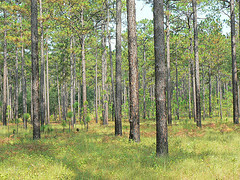 Southern pines as they greeted the first European explorers were described as “the most stately pine trees that can be imagined, planted by nature at a moderate distance. . . enameled with a variety of flowering shrubs.” Yet today there are problems in America’s Southern pine forests that can feel overwhelming. the desire for recreational value that declines as all of the above-listed problems increase. 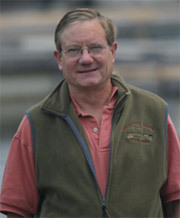 What’s a landowner to do? What kind of impact can a single landowner make on his or her land? A lot, as it turns out. All of these problems can be turned around simply by restoring longleaf pine ecosystems. The restoration, of course, is not that simple - but the guiding principle is. Problems that we face in the South today in large part find their origins in the wholesale conversion of native longleaf pine forests to loblolly and other species of pine. The conversion happened in the late 1800s and early 1900s as lo ngleaf was intensively logged for its fine straight poles and the production of tar and turpentine. 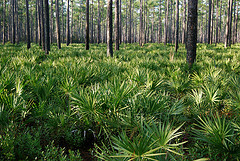 After all the longleaf was gone, everyone wanted loblolly, since it appeared to be the more profitable and faster-growing species. However, studies conducted by researchers and organizations affiliated with the Longleaf Alliance over the past decade have revealed a truth about longleaf that had been forgotten: over a 25- to 30-year rotation, its growth catches up to loblolly. What’s more, it grows straighter and fetches a premium price for poles compared to the price of pulpwood. Check, on the need for sustainable and profitable timber! Check, endangered species and plants. Check, susceptibility to wildfire, which decreases with regular burning. And check, many (though not all) species of invasive plants, which often are not fire-adapted. In fact, the more I talk to people involved in longleaf restoration, the more I have begun to think of them as having “got religion” - the kind with tufts of three needles 8 to 18 inches long. How about disease and storm damage? “Longleaf, also known as pitch pine, responds with a greater flow of sap when attacked, making it less susceptible to the Southern Pine Beetle,” explains Gaines. Check, storm and wind damage. In short, there are many reasons that longleaf is growing in popularity among landowners and conservationists throughout the South. Next week I’ll introduce you to a landowner who “got religion” after Hurricane Ivan and has become expert in restoring and maintaining his longleaf woodlands. Thank you for spreading the word about longleaf regeneration. With each longleaf stand comes a personal story that often stretches across generations. My husband's family homesteaded in Covington County, a stone's throw away from the Longleaf Alliance. We are very grateful for the work of the Alliance and landowners like Dr. Saloom whom, I believe, you will be featuring next week.